Burger King expands their value options at the $6 mark with the introduction of the new, limited-time $6 King Box deal at participating restaurants. For the price, you get your choice of either a Whopper, Crispy Chicken Sandwich, Spicy Chicken Sandwich, or 3-piece Chicken Tenders, plus a small order of fries, a small drink, and two chocolate chips cookies. The other option at the $6 price point is the two for $6 Mix or Match deal, which has been available for some time and features a choice of two of the entrees mentioned above. So while the King Box is available, you can basically choose between getting a second entree or fries, a drink, and two cookies. 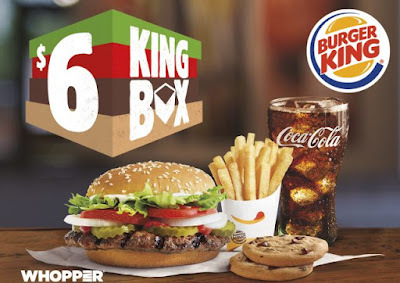 The King Box also appears to be Burger King's answer to McDonald's recent $6 Classic Meal Deal.